Export recorders allow you to independently record the temperature of your export shipments. Once the journey is complete, check the recorder to make sure no temperature exceptions have occurred and dispose of the recorder. If a temperature exception has occurred, return the recorder/ logger to us for a post shipment report. Global Sensors Strip Chart Temperature Recorder is an inexpensive, highly reliable battery powered time and temperature recorder. It generates a permanent strip-chart record of temperature conditions during storage or transportation of temperature sensitive products. Available in 10, 20, 40 or 75 day duration models, the unit is easily activated by simply removing a start tab. The unit is then sealed up and placed at the desired monitoring location. At destination or at the end of the recording episode, the chart is removed from the recorder and the temperature history is reviewed. Temperature vs. time is clearly graphed on a narrow strip of pressure-sensitive paper. Simple to use strip chart recorders are the standard in the perishables shipping industry, and the Global Sensors unit is the standard for service, performance and cost-effectiveness. The chart is clear and easy to read, and represents documentary evidence of the temperature maintenance in transit. Proper running is verified through a clear view window. 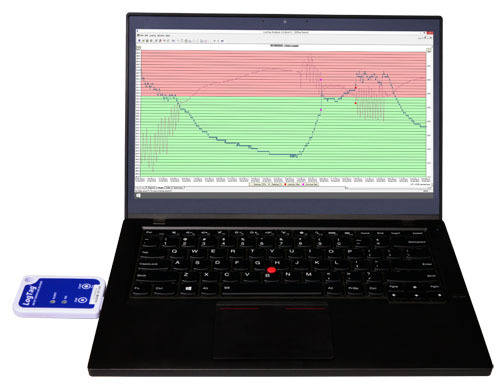 The Global Sensor recorder is not only a state-of-the-art instrument, but it also is supported by our full service post trip follow-up when required. The clear view port confirms running after the start strip is pulled. Carbon copy evidence of the trip is provided by the integral form on the recorder. Alert & OK indicators Indicate if readings are outside of preset limits and if still recording. The LogTag SRIC-4 is a single-trip temperature recorder developed specifically for monitoring temperature sensitive products in both short haul and long-distance transportation applications. The SRIC-4 combines all the features of an advanced temperature recorder with a 3968 log memory and a 6-month operating life in a robust and inexpensive package. When used in conjunction with the standard LogTag Interface Cradle and the freely available LogTag Analyzer operating software, the SRIC-4 can be easily configured by the user for a wide range of recording and alert conditions. Alert indicator provides an immediate indication, without access to a PC, if any readings are outside the limits specified at the time the unit was configured. The SRIC-4 incorporates an external temperature sensor uniquely arranged in a recess in the case. This arrangement protects the sensor from physical damage while retaining the faster response time normally associated with remote sensors. Inspection mark Inspection mark by push button. 3968 recordings capacity Enough memory for 13 days @ 5 minute logging, 41 days @ 15min logging and 82days @ 30 minute logging. The LogTag® USRIC-8 PDF Temperature Recorder measures and stores up to 8,000 real time temperature readings over a measurement range of -25°C to +60°C. Enclosed in a robust and durable polycarbonate case, the USRIC-8 plugs directly into the computer USB to automatically generate a fully detailed PDF report with the option to download the data using the freely available LogTag ® Analyzer software for a more detailed analysis. Up to 8,000 recordings - enough for the longest trip with in-transit inspections which can be recorded at the push of a button. Robust and durable polycarbonate case with lug for secure mounting. Complies with industry standards. Click the brochure link to view a list of compliance standards.